Figure left: GIF video of the 04:00:29 UT fireball. Images to the left show the development of the persistent train at different times after the fireball. Meteors are caused by the big grit of comets that accounts for most of their mass loss. Although the dust grains range from a mere 0.5 mm to 20 cm in size, that is considerably larger than the tiny micron sized grains responsible for the scattered light of comet dust tails and the grains typically encountered during past comet fly-by's. That makes meteors the perfect tool for finding out if there is anything unusual about comet matter at this sort of size range. Meteorites (asteroids) are known to contain numerous chondrules, sphreres that are formally molten droplets of matter. Those chondrules always tend to be about a millimeter across. Do comets contain similar chondrules? This question is still under investigation. However, Peter Jenniskens and Rick Rairden report in an upcoming issue of Earth, Moon and Planets that some Leonid meteoroids do contain unusually tough pieces of matter. A particularly hard bit of the spectacular full-Moon class 04:00:29 UT fireball (above) survived down to 55 kilometers altitude. That is three atmospheric scale heights deeper than where most other Leonids suggest the meteor should have ended. Figure right: The Y2K train at 4 and 8 minutes after the fireball shows much the same structure. The fireball was observed when the participating aircraft in the Leonid Multi-Instrument Aircraft campaign flew over the isle of Corse on November 18, 1999. Once the meteor's afterglow had fainted, a persistent glow remained. That train was observed for more than 13 minutes, before the aircraft had to continue on to the Azores. The train was immediately christened the "Y2K train" by Mike Koop, one of the surprised observers. Jenniskens and Rairden were able to use their persistent train observations from the stereoscopic perspectives of the ARIA aircraft (above) and the FISTA aircraft (below) to reconstruct the fireball trajectory. The result was confirmed by Jiri Borovicka, who calculated the trajectory independently from the available spectroscopic (FISTA) and imaging records of the meteor (ARIA). The train is of the "billowing" type. 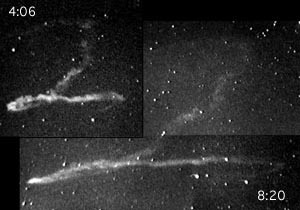 The images to the left show billowing structure that persists over long periods of time, but tends to smear out gradually along the meteor's path. Buoyancy of the hot air may be contributing to the early changes in the shape of the train (top figure). The corkscrew pattern at later times, making up the letter "2", is the result of changing atmospheric wind directions with altitude. Those motions are caused by gravity waves, bubbles of hot air that have risen from lower altitudes to expand and create gale winds. A radial wind profile analysis of persistent trains, using LIDAR measurements obtained with the University of Illinois sodium lidar at the Starfire Optical Range, is reported by Grime et al. in a recent issue of Geophysical Research Letters (Vol. 27, 1819). Now, the stereoscopic imaging enables a three-dimensional reconstruction of the wind speeds, which amount to around 58 meters per second at this particular location and point in time. A vertical scale height of 8.3 km was measured for the rate of rotation of the wind velocity vector between 79 and 91 km altitude (Full paper - PDF).